With a rich heritage, and origins dating back to 1795, the Dixon Ticonderoga Company throughout history has made its mark through quality, integrity, respect and perseverance. Today Dixon Ticonderoga continues to make its mark manufacturing and marketing writing instruments, art supplies and tools for self-expression. 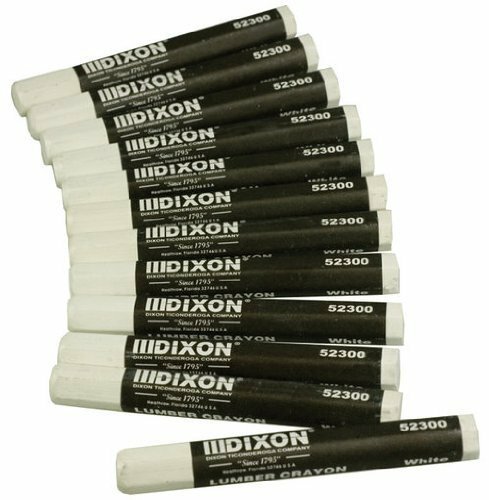 Dixon Lumber Crayons last up to 10 times longer than ordinary molded wax crayons. Fade-proof, water-proof, smear-proof, these crayons won't melt in direct sunlight. They will work on wet (green) lumber or dry wood, metal, concrete and most other surfaces. Each crayon is individually UPC coded and hex shaped (4-1/2 x 1/2 inches) to fit lumber crayon holders. One dozen per box. White. If you have any questions about this product by Dixon Ticonderoga, contact us by completing and submitting the form below. If you are looking for a specif part number, please include it with your message.